All of the things. I want to do all of the things. 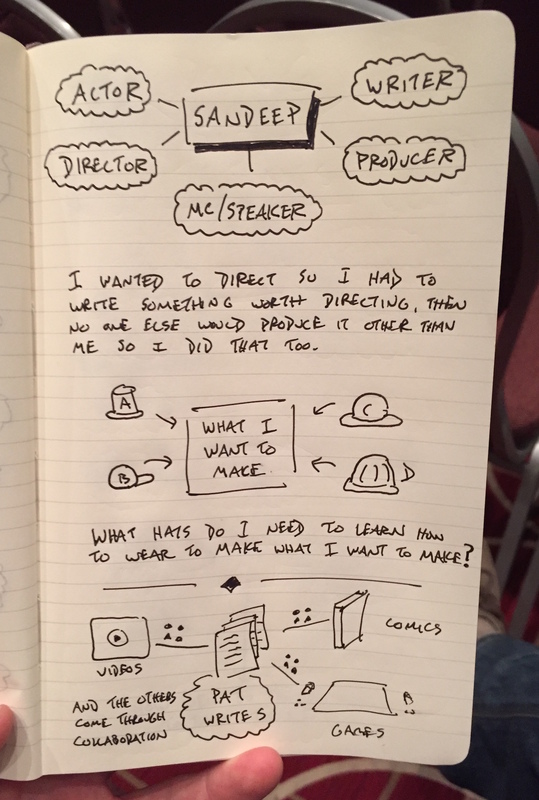 I want to keep putting my sketchnoting skills to use and sharing what I’m learning here at The Graphic Recorder. 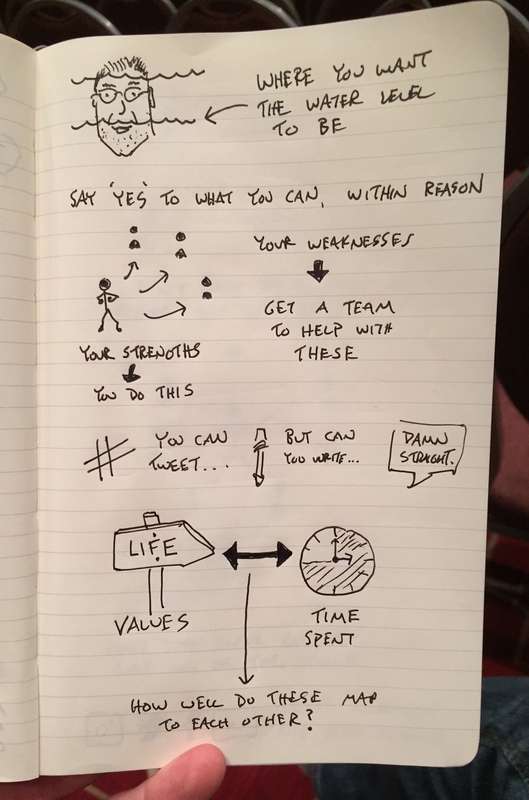 I want to help others build their own visual note-taking skills over at Verbal To Visual. I want to continue exploring what it means to Learn In Public and how to do it well. And I want to keep experimenting with a semi-nomadic lifestyle and make videos about it on YouTube. And so the aptly named panel at NerdCon: Stories earlier this month was right up my alley. Panel members include John Scalzi, Leslie Carrara-Rudolph, Mikki Kendall, Javier Morillo, Sandeep Parikh, and Patrick Rothfuss. Oh hey look, it CAN be done. That there are people out there that in fact do all of the things gives me hope that I will find a way to do my version of it. What I’m realizing now is that it takes specific skills and habits to make this approach to your career and life feasible. So let’s start identifying them. 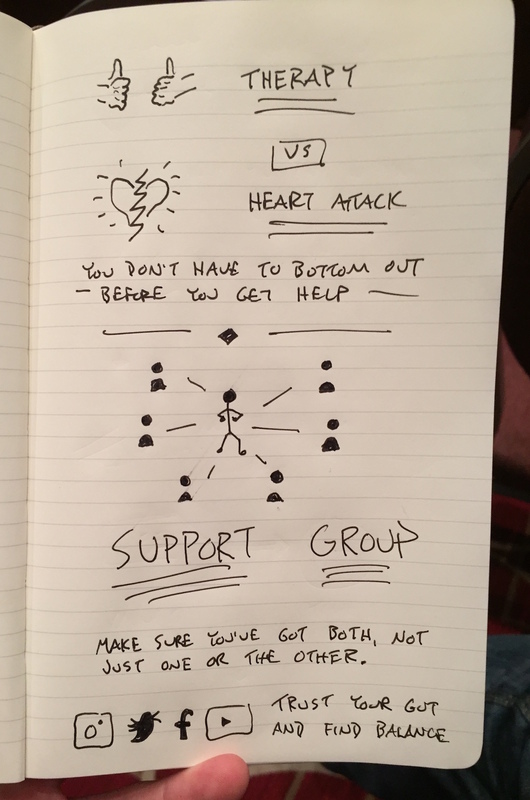 The importance of a team / collaboration / support group / therapy. You can’t do all of the things if you’re doing it all alone. Various layers of support are required. I’ve got some of those layers in place, but not enough. I’m part of a mastermind group that meets weekly (via Google Hangouts) to share our progress and struggles building online businesses. That has been extremely helpful over the past few years. I’ve got in-person friends that support the work that I do, who provide anywhere from general encouragement to concrete counsel when I need to talk through a problem. But I don’t have anybody helping me to build what I’m building. I’ve been doing it by myself, and I think that needs to change. I don’t know what exactly that will look like but I have recognized both a need and a desire to bring on some sort of a partner to help me continue to build these projects. And I don’t go to therapy, but I think I should. I spend so much of my days in my own head and working alone. And I don’t currently have a space to clear out the clutter and give myself perspective (morning pages helps with that, but that’s another habit that hasn’t yet stuck). The moment that therapy was suggested on the panel multiple members threw two thumbs in the air to show their support. That doesn’t keep me from feeling vulnerable right now because of the stigma that still exists around it, but I’ve heard from enough people (whom I admire) who swear by it, so I think it’s time I give it a try. Keep the water level above the mouth but below the nose. If you want to do all the things you’ve got to work for it, but not so hard that you burn out. That’s a balance I’ve yet to strike. I have a tendency to pile too many short-term projects (book here, course there, travel video series over there) on top of each other. I need to find a better balance between recurring output (weekly videos and/or blog posts) and those discrete projects (that I should tackle one at a time). Back up your stated values with your clocked time. Do my actions maps to my priorities? That’s a questions I need to regularly ask myself. Sometimes they do, other times not. I don’t currently have the daily, weekly, or monthly structures/routines in place to make sure that I’m spending my time wisely. This list gives me a lot to work on – specific things to act on that will have a direct impact on my ability to do all of the work that I care about. 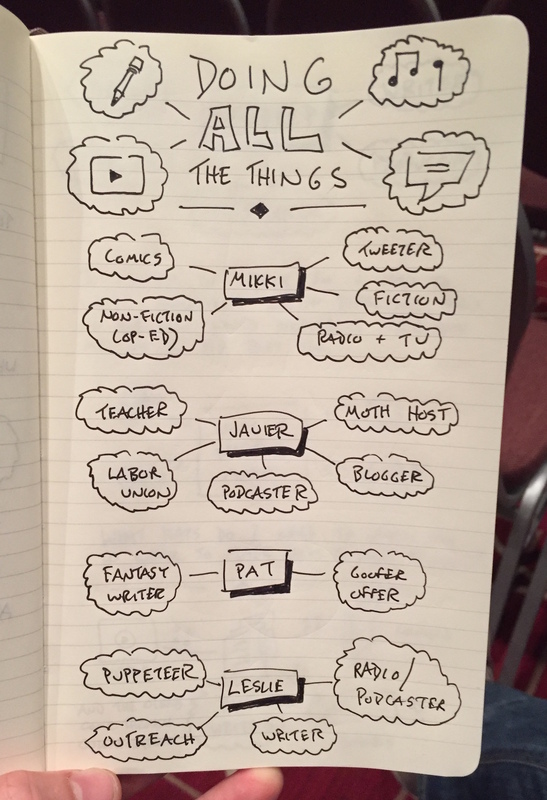 Thanks to NerdCon: Stories and the panel members for sharing these ideas.